Tarsha Moore stands as tall as her 4-foot 8-inch frame will allow. Staring straight ahead, she yells out an order to a squad of peers lined up in three perfect columns next to her. Having been in the military program for six years, Tarsha has earned the rank of captain and is in charge of the 28 boys and girls in her squad. This is Lavizzo Elementary School. Tarsha is 14. The Middle School Cadet Corps (MSCC) program at the K-8 school is part of a growing trend to militarize middle schools. Students at Lavizzo are among the more than 850 Chicago students who have enlisted in one of the city’s 26 MSCC programs. At Madero Middle School, the MSCC has evolved into a full-time military academy for kids 11 to 14 years old. 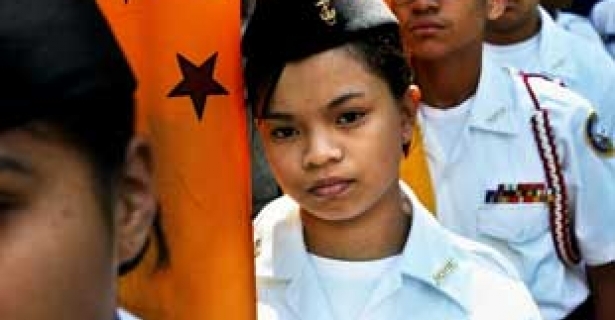 Chicago public schools are home to the largest Junior Reserve Officers’ Training Corps (JROTC) program, which oversees the MSCC, in the country. When moving up to high school, Chicago’s graduating eighth-graders can choose from 45 JROTC programs, including three full-time Army military academies, five “school-within-a-school” Army JROTC academies and one JROTC Naval academy. Proponents of the programs tout leadership training and character development. But critics quote former Defense Secretary Gen. William Cohen, who described JROTC as “one of the best recruiting services that we could have.” Rick Mills, the director of Military Schools and JROTC for the Chicago Public School system, dismisses these concerns. “These kinds of programs would not be in schools if there weren’t kids who wanted it, parents who supported it and administrators who facilitated it,” he says. The elementary school cadet corps is a voluntary after-school program that meets two or three times a week. Programs differ from school to school, but MSCC students generally learn first-aid, civics, “citizenship” and character development. They also learn military history and take field trips to local military bases. Once a week, students wear their uniforms to school for inspections. Tarsha describes buffing her uniform shoes in preparation for inspection days. “Everything has to be perfect,” she says. During drill practices they learn how to stand, turn and salute in synchronization. When they disobey an order, they do pushups. “Only 10,” says one administrator. Joanne Young, a sixth-grade teacher at Goethe School in Chicago, recently wrote a letter to the local school council protesting the implementation of the cadet corps in her school. “I was told that it is not a military program, yet every aspect of it is military,” she wrote. “This program is training our students, as young as 11-years old, to march in formation and carry guns. … Students could be suspended for bringing something that appears to be a weapon to our school, yet we are handing them fake guns for this program.” Young, like many other teachers, feels that leadership and discipline could easily be taught in other types of after-school programs. In 2002 the Bush administration passed the No Child Left Behind Act with a small, unpublicized provision: Section 9528, “Armed Forces Recruiter Access to Students and Student Recruiting Information,” requires high schools to give all student contact information to the military. Most students aren’t aware they can opt out by filling out a form. Ranjit Bhagwat, an organizer for Chicago’s Southwest Youth Collaborative, has worked with students at Kelly High School in Chicago to inform their classmates about the provision and how to opt out. The Kelly group, founded in January, has already convinced more than 10 percent of the school’s population to sign the opt-out petition. Bhagwat says the group targeted military recruitment because the students felt the military’s presence in their school was an issue that needed to be addressed. “They had a problem with the fact that there were a lot of lies the military told,” he says. The MSCC and JROTC programs are funded by the Defense Department, which has a $3 billion annual recruitment budget. Recruitment officers roam high schools promoting the image of a secure military career and enticing students with promises of money for college. The “lies” mentioned by Bhagwat include the reality that, on average, two-thirds of recruits never receive college funding and only 15 percent graduate with a four-year degree. As for a “secure” career, the unemployment rate for veterans is three times higher than non-veterans. Opponents of the JROTC program also cite ethnic profiling, arguing that the military targets students from minority and low-income areas. The Chicago Public School system is 49.8 percent African American and 38 percent Latino. Students coming from low-income families make up 85.2 percent of Chicago’s student population. JROTC director Mills is correct when he says the racial and socioeconomic status of those in Chicago’s JROTC program reflects the school system as a whole, but only five schools in all of the more affluent Chicago suburbs have JROTC programs. Military recruiters are known for their flashy tactics: television ads, omnipresent brochures, recruiting ships, trucks and vans, and even a free Army video game kids can download off the Internet. Yet, the Army hasn’t met its recruitment goals in three months. The Marines haven’t met their quotas since January. Suspicious recruitment tactics are in the headlines and Army recruiters took off May 20 to retrain in the ethics and laws of recruitment.